There are three different colors that fall under the "snow" catagory. make them quite outstanding and gorgeous. Most SLP's are born pure white, although sometimes there can be a slight shading of color and they develop more coloring as they get older. Pictured below is Frosty (SLP) with new one day old babies. You can see the various shades of coat colors in the kittens. Frosty was bred to Breaker for this litter so all the kittens are SLP. Pictured above is Breaker (SLP) with his gorgeous rosetted coat developed. 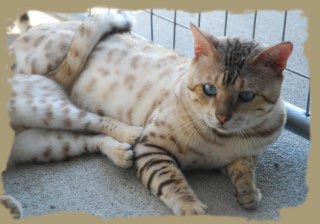 The Seal Mink Bengal has a background color which can be ivory, cream or light tan with markings that can be various shades of light to dark mink coloring. They usually have the aqua blue colored eyes, but can also have green eyes. The Seal Sepia Bengal is the darkest of the snows. The background can be ivory, cream or light tan with brown to dark brown markings. Their eye color is typically green. This color is the result of the Burmese gene was introduced to create a more contrasted snow. Ripley is a gorgeous seal sepia marble bengal. She is the grandaughter of LA IW SGC Suwanee Fudge Ripple who is a very famous seal mink bengal.